As a card carrying costal liberal, I've had much cause to retreat into imaginary realms these days. Even though I have a full VR headset, I still love my flat screen games that doesn't involve shooting zombie hordes or being a space pirate. 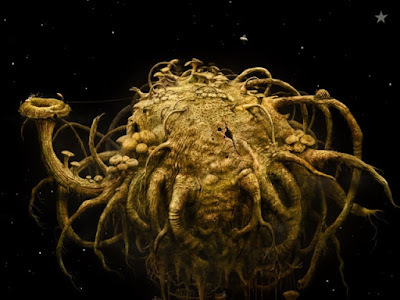 My current favorite is the exquisitely detailed microworld of Samorost 3. 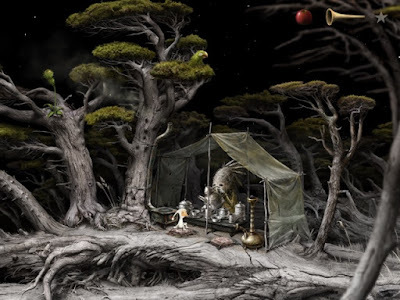 I made it to the tree root planet where a tree root wizard served a milky tea to my character- a trumpet playing gnome with a white full body unitard. The wizard's hospitality did not extend to the shisha so my gnome secretly snuck a puff by tapping the parrot above the tree who pooped on the tent causing the wizard to get distracted by cleaning the mess. The lovely visuals and the clever cheeky gameplay lent some levity to this holiday weekend. The tea that matches the gnarled and knobby aesthetics of this game would be ku gua cha- dried up gourd stuffed with Anxi Tie Guan Yin then roasted. I had gotten my big box from Kunming last week and this tea was the crowd pleasing winner that I was going to gift out this season. Yes, I finally caved after one of the YS sales alerts. It was the aged puerh sale that nabbed me and really it was the stress of the post-election reality that pushed me over the edge. It dawned on me that my stress response is not drinking tea but rather buying it since I drink tea everyday multiple times a day under all conditions fair or foul. I ordered whatever little ku gua cha left in the YS US store and also a full gourd off Ebay. It's not clear if there is a range of better gourd teas available or the genre is mostly generic. 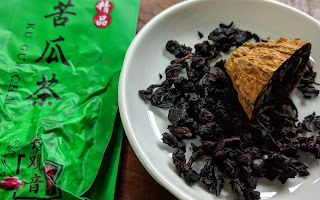 The oolong is heavy roasted in the style of Sea Dyke and definitely a notch tastier- a welcome diversion from the daily slog.